Autobuy Makes Wishes Come True! We’ve just made it even easier to buy and sell albums on Murfie! 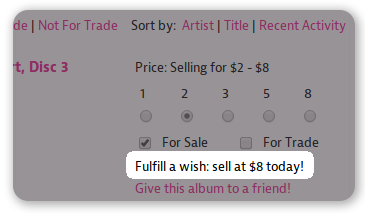 With our new Autobuy feature, you can choose what price points you’d be willing to buy an album for when it’s added to your Wishlist. (You can also go to your Wishlist and choose price points for those albums at any time). As a seller, you can go to your Collection and look under your discs marked for sale, to see what price people would be willing to buy them for. Then you can adjust your price points accordingly, and the real wish-granting magic happens! When the album becomes available for someone’s desired price, it will be bought automatically! It’s like we’re shopping for you when you sleep! Zzzzz. Head over to your Wishlist and see what the buzz is all about—then add even more albums, and set your Autobuy price!